Our exceptional and friendly staff is our greatest asset. Karla, Tina and Joy are all CPO certified and excited about what they do. They care personally about getting the best results for our patients. Our staff will try to accommodate your busy schedule by finding appointments that suit your needs as well as help you understand your insurance coverage. They are also very well versed in choosing a frame that not only looks amazing on your face but also one that best fits for your prescription. 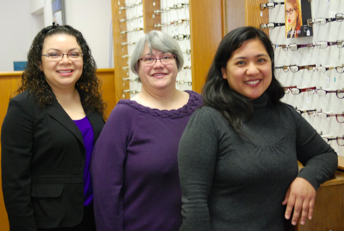 They understand the many lens options and can explain which one would best suit your needs.